Ten years ago today, I went through a tough time. Okay, that’s a bit of an understatement, but you know what I mean. I don’t hide my experience from people, in fact, almost the opposite—I often blurt it out at an unexpected moment, shocking both of us. It often results in stunned silence, followed by a hug. I don’t do this because I want to be hugged (although it’s often more than welcome) but rather because I want people to know that life can be unfair and sometimes, bad things happen to good people. So we must cherish the time we have with the people we love and also be aware of how those close to us are feeling. And just like the old proverb ‘it takes a village to raise a child’, it took a village to get me back on my feet after my unthinkable happened. Leading the charge were my family; my mum and brother were never far from my side and in the distance was dad—caught up in his own grief and almost insurmountable sadness—who kept passing through into our bubble and then back to his own. Hushed phone calls were made from different rooms of the house and bouquets of flowers arrived on mass bringing messages of love. Days turned into weeks, which turned into months. Friends rallied around, but when faced with my endless grief and the look of devastation that was imprinted across my face, most drifted away. But then something unexpected happened; I made new friends. I was embraced by a group of girls who had known the person I’d lost and could understand how what a gaping hole he had left in my world. They slowly brought love and laughter back into my life and in the decade since we have celebrated new homes, new jobs, new babies, new loves and new beginnings. We have pounded the pavements around Brisbane with conversations that never seem to end; they just pick back up where we last left off. We have danced in the dark and run from the rain; stood gazing sky high at the fireworks of Riverfire and held each other’s hand through heartbreak and hospital visits. We have taken holidays together, shared homes, secrets and hairdressers and talked more rubbish than you could ever imagine. Last year we started our own gourmet dining group, although sometimes all we need is to share a pizza and chocolate in our ugg boots. A few weeks ago, we joined together to celebrate the impending nuptials of our friends Nell and Rod with a bridal shower at Mondo Organics. As part of the celebration, we were asked to share how we each knew the bride-to-be and when my turn came, I unexpectedly burst into tears and then struggled to get my words out. You see, Nell is one of those girls; one of the small number of people who saved me from myself; who saw past the tears and the self-deprecating sense of humour to the girl inside. She has seen me at my best, my worst and everything in between. She has encouraged my dreams and talked me through disappointment. She has fed not just my stomach, but my soul. I cried as I tried to explain that 10 years ago I was given a gift which came in the form of Nell, Jenny, Jane, Nits, Gayle, B and Tamie. They came into my life, made themselves at home and decided to stay and for that I am eternally grateful. As strange as it may sound, I like to think that because the person I loved couldn’t be here, he left me in the arms of those who could; those who would keep his memory alive for me and would bring a smile back to my face and tears to my cheeks—because I’m laughing so hard. So today—on the 10th anniversary of his passing—I will think of him as I frock up and join with the girls to watch our dearest Nelly tie the knot. Because 10 years on, I know I am loved. 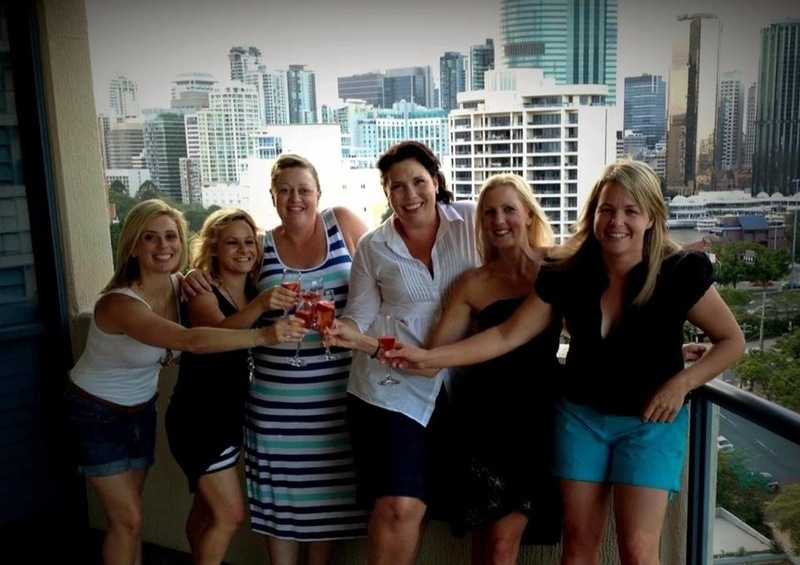 Me, B, Nell, Jane, Tamie and Jenny celebrating New Years’ 2012/13. I agree Vicki! I’m very lucky to have found them.